Movie: "The Purple Rose of Cairo"
America is in the midst of the Great Depression and Cecilia (Mia Farrow), like many other Americans, is struggling just to make ends meet. She works as a waitress and does laundry after work to support herself and her unemployed, abusive, gambling, alcoholic husband (Danny Aiello). Her only real joy comes from escaping to the cinema to catch the latest film. After getting fired from her job and catching her husband with another woman, she spends a whole day at the theater watching the latest movie "The Purple Rose of Cairo," a film she has seen already seen a couple of times. Midway through her fifth viewing, a character from the movie named Tom Baxter (Jeff Daniels) takes notice of Cecilia, is infatuated by her beauty, and steps off the screen in an effort to woo her. This causes chaos within the film itself and causes the producers, as well as the actor who plays Tom, Gil Shepard (Jeff Daniels), to rush from Hollywood to New Jersey to get Tom back on the screen and into the picture. 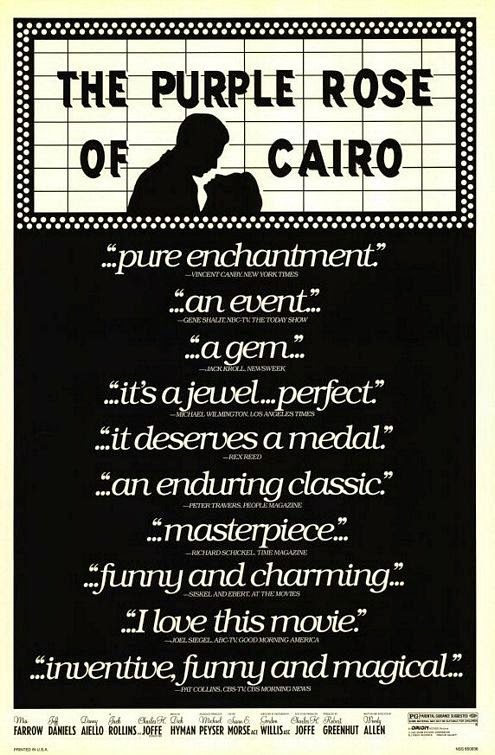 "The Purple Rose of Cairo" is another example of a film directed by Woody Allen but without starring Woody Allen that we absolutely enjoyed! It boasts a rather uniquely odd concept and plot where a character in a movie steps out of the screen and into the real world, only to be chased down by his actor counterpart. The character of Tom Baxter holds all the same characteristics as his on-screen character does in the movie, and none of the traits of the actor Gil Shepard himself. Tom Baxter is noble, chivalrous, romantic, and sweet yet naive and has his head in the clouds, while Gil Shepard is much more career-oriented and self-interested. Jeff Daniels plays both of these parts wonderfully and it was nice to watch him in an early and likable role after seeing him in "Dumb and Dumber To." Mia Farrow is a rather meek character for most of the movie. Despite the fact that she is the primary breadwinner in her house, she continually goes back to her abusive, cheating husband time and time again. She uses the movies as a chance to escape from her real life, and by that respect, also has her head in the clouds. When Tom Baxter steps off of the screen and into reality, he is stricken by Cecilia's beauty and the fact that she had seen his film a bunch of times. Tom is in love with her, but is also being chased by Gil. Once Gil meets Cecilia, he too falls in love with her. The object of both men's affection, Cecilia, for once in her life, gets the chance to choose her destiny. The movie itself is very funny and has a lot of humor in both reality and in the movie once Tom exits the picture. The bickering between on-screen character about who the true lead of their film is is rather hilarious. All in all, this movie is charming, sweet and one of Woody Allen's better films with many great and believable performances and interactions between actors. The music is great, the imagery is spectacular and indicative of the time period, and there is a lot of magic is to be had in this film.